Artist David Rickerby has been travelling, skydiving and painting for 25 years, and has now compiled this website for the most enjoyable viewing of his artwork. Click on the thumbnail of any piece to get a better look, and don't miss the 'zoom in' buttons when they appear! Over the years, David has painted thousands of pieces on hundreds of surfaces, including oil paintings, murals, parachute containers, motorcycles, vans, boats and airplanes, or as David says, 'Anything that will stand long enough to paint on! ', and he's also designed hundreds of computer graphics, logos and t-shirt designs; all as detailed ...Expand text. Artist David Rickerby has been travelling, skydiving and painting for 25 years, and has now compiled this website for the most enjoyable viewing of his artwork. Click on the thumbnail of any piece to get a better look, and don't miss the 'zoom in' buttons when they appear! 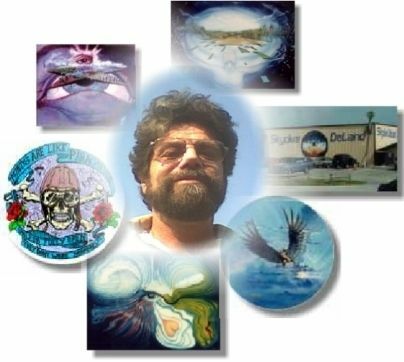 Over the years, David has painted thousands of pieces on hundreds of surfaces, including oil paintings, murals, parachute containers, motorcycles, vans, boats and airplanes, or as David says, 'Anything that will stand long enough to paint on! ', and he's also designed hundreds of computer graphics, logos and t-shirt designs; all as detailed and individual as the people or subject they were intended for. This website features a selection of his work, however, there are still hundreds of pieces to be added! David is asking all Rickerby artwork owners to please send photographs or jpeg files, and get in touch so your pieces can be included on this site! Also, because this site is still in the preliminary stages, David would appreciate any comments, suggestions and feedback. Your criticism is educational and essential, so insults are welcome! Close text. This Account Created Dec 26, 2002 04:05 am. The final piece in a series of oils commissioned by Greg Kroll. Although all the paintings were paid for, Greg apologised for not collecting this one, and asked David if he would mind re-selling it. It's now in the private ...expand text. Depiction of two boys growing up together, playing with paper airplanes. One of them has symbolically tripped. This painting and 'The House of Cards' were both commissioned for a book that was intended to be a biography (on their story) ...expand text. A part of the private collection of Heidi Coe. Like 'Boys and Jets' this painting was created to be used in a book. When two boys who were best friends grew up, they worked for separate companies flying jets, and often racing each other, in and out of Newark, ...expand text. The rolling hills and pastures of Pennsylvania is the view from the home of Jeff Hertz. JOE CAMEL'S VIEW ON EARTH, WIND, FIRE AND WATERAnother Rickerby classic that dictated itself during it's creation. Upon completion, David thought it looked like Joe Camel smoking a cigarette.YEAR: 1999 SIZE: 24x36 in. (canopy relative work), or 'crew'. Although it was Mike GOODEN'S dream to complete this canopy formation, it was never done because of it's difficulty. Mike latter went on to complete a 50 canopy formation. The painting is situated over Titusville, ...expand text.